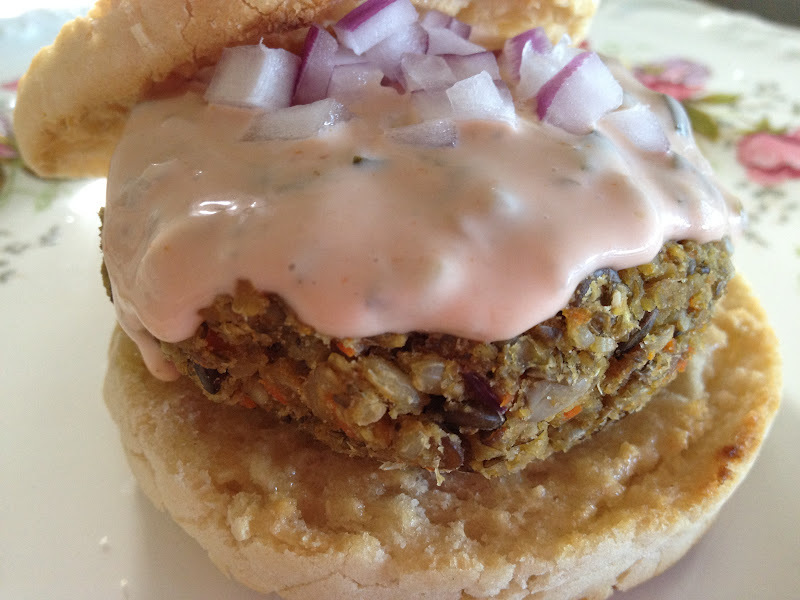 Lentil burgers with red onions and my favorite dressing. The Nooch is the key to these great tasting burgers. It’s the cheese-y flavor combined with the hearty lentils that make this a BURGER! Make the lentils and brown rice ahead of time. Preheat oven to 350. Toast sunflower seeds in the oven for about 5 minutes. Finely dice the onion (saving some for dressing the burgers) and sauté in olive oil and a dash of salt. Dice the carrots and add to the onions. When the vegetables are soft, combine with the lentils, brown rice, sunflower seeds, and Nooch. Process about 3/4’s of the mixture and then combine back in with the rest. Add the brown rice flour and salt and mix well. Make 4 standard size burgers or 12 mini burgers. Bake for 20 minutes flipping them over at the 10 minute mark. Freeze leftovers. Mix as much as you need, to your taste. Toast up some gluten-free English muffins, spread Earth Balance on both sides, place the lentil burger on the muffin, top with Russian dressing and red onions. Enjoy!